In summer we often have a bowl of roasted vegetables in the fridge. They are cold as good as fresh out of the oven, perfect on a sandwich or in a salad. We kind of got stuck with , bell peppers, onions, pumpkin, all of them very sweet in taste and cauliflower and courgettes. I am currently trying out all sorts of grains that I have never eaten, not to speak cooked with before. Buckwheat is one of them. They make a perfect base for a salad and can also be made in advance as it keeps in the fridge for a couple of days. Mix all ingredients for the dressing just before adding to the salad. 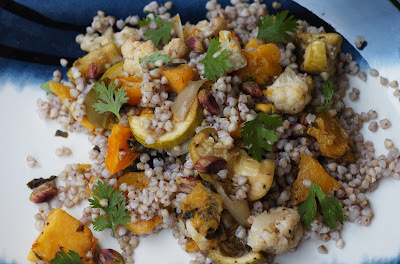 Add roasted vegetables (either hot or cold) to the buckwheat (also either hot or cold) add the dressing and sprinkle the pistachio kernels and coriander leaves on top.